The information detailed below was kindly provided by The Tyne Riverside Country Park at Newburn. Acknowledgements: Eric Nicholson (for the text) and Gillian Brown (for local information and advise). For permission to use photographs: Les Lewis, Mr. J.C. Tyson, L.Walton, Newcastle City Libraries & Arts, Local Studies, West Newcastle Local Studies. Newburn has a remarkable history. Because of its position on the river Tyne it was considered more important than Newcastle before the Norman Conquest! 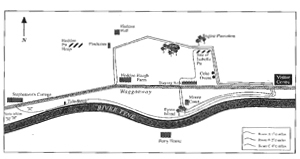 Newburn was the first point at which the Tyne could be forded, so down the ages, was always important strategically. 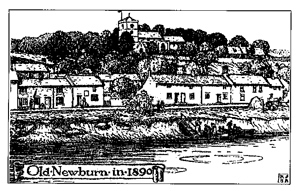 Newburn takes its name from New Burgh; a castle or defensive place, although the Concise Oxford Dictionary of English Place Names gives the meaning as ‘new stream’. The village has been the site of much conflict in the past. 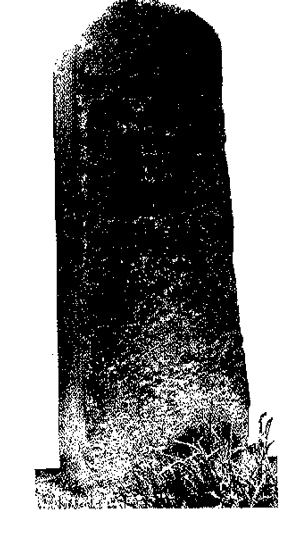 The church with its impressive Norman Tower has witnessed at least two major insurrections within its grounds. During the last century Newburn was a world renowned centre for three burgeoning industries: the coal, steel and railway industries. This was a time of great prosperity for the village. After the closure of the steel works in 1926 the population experienced its share of hardship and poverty. Our First stopping place is the launching ramp opposite the Park Centre. 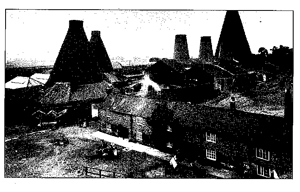 Looking left we can see the site of the former Stella North Power Station and a cone-shaped structure which is a brick furnace built in 1787 for the Lemington Glassworks. Of its type it is one of a very few remaining in the country. As we follow the Tyne downstream, look across onto the opposite bank and if the tide is out you will see piles of rotting wood embedded in the sandy bank. This is were barges and boats were dumped when they were no longer useful or sea-worthy. Stop at the Boat House Inn and note the marker on the wall recording a severe flood in 1771. There are markers recording other floods in 1815, 1832 and 1850. Behind the inn is the site of the Newburn North Eastern Railway Station. The line was closed in 1968. 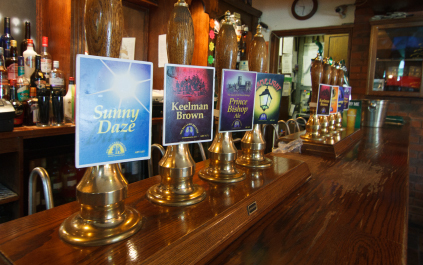 Continue eastward and our route takes us on to the Wylam-Lemington waggon way. This line was built around 1748 and was used to transport coal from Wylam to Lemington staiths. Although the rivers Tyne and Wear were convenient ‘arteries’ for transporting coal, there had always been a problem in transporting the coal from the mines to the rivers. The waggon ways were built to overcome that problem. The first wagons were horse-drawn along wooden rails which were replaced in 1808 by cast-iron rails. By 1815 the waggons between Wylam and Lemington were pulled along, 8 at a time at 5mph, by steam engines designed by William Hedley (who is buried in St Michaels & All Saints Church, Newburn). Two of Hedley’s locomotives were known as The Puffing Billy and Wylam Dilly. A contemporary account describes the invention thus; ‘A stranger is naturally struck with the imposing appearance of an engine moving without animal power, with celerity and majesty, along a road with a number of loaded carriages in its train’. 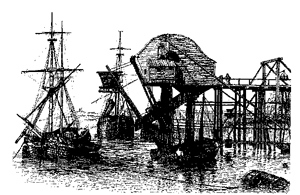 At the staiths the coal was loaded into ‘keels’ and hence to ships at the busy Tyne ports. Keels were a kind of barge about 40ft long by 16ft wide. They were propelled by a single oar at the stem and stern and often had a sail that could be raised. Keelman formed a distinct community, many being of Scottish origin, and lived mainly in the area of Sandgate. The work was hard and unremitting and demanded strength and endurance. As you walk along the wagon way you will come to Newburn bridge built in 1893 by the Water Company. Up until 1947 a toll was charged to cross it. Continuing along the wagon way you come to a wooden building on the left- a car scrap yard- and an industrial estate on the right. 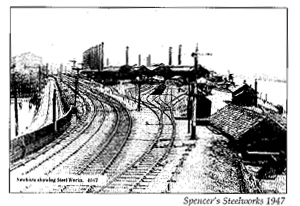 This was the site of John Spencer’s Steelworks. 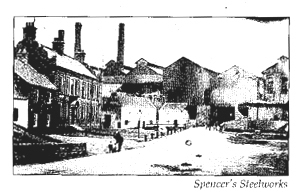 The Spencer family were early industrialists who changed the face of Newburn. The first John Spencer established a mill for the manufacture of files at the beginning of the 19th century. At the end of the century his son, also named John, was Managing Director of a huge industrial concern employing 1,500 workers. Steel plates, springs and other items were provided for the railway, shipping, armaments and mining industries all over the world. The large steel plates for the ship Mauretania were made in the Newburn factory. After the First World War demand for steel lessened and the factories were closed in 1926 and demolished in 1933. Much of the legacy of John Spencer can be discovered in Newburn Village, which is our next destination. Turn left off the waggon way, go past the scrap yard and cross the main road which spans the New Burn. You will be near a two-storey red bricked building which was the Spencer Office at the turn of the century. Walk a few yards further and you will notice a plaque on a building which was built for the Duke of Northumberland and occupied by the county bailiff in 1822. Next to this building is a row of single storey houses, the Alms Houses, built by the church in 1870 for the elderly. Opposite you will see a grey stone building; this was the hospital built by Spencer for his work force and local people. If you cross over the road and look above the door you will see the inscription, ‘Newburn District Cottage Hospital 1909’. The white building on the same side of the road is ‘Newburn House’ and was the doctor’s house in Spencer’s time (and still is today). Cross over Station Road and you will be facing the impressive Mechanics Institute- now used an elderly persons’ residence. If you walk down the drive into the car park you will see an inscribed stone laid by a Lady Wilberforce in 1884. Now cross over the main road and enter the church grounds through the lych gate erected by John Spencer. The Spencer and Hedley families are buried here. George Stephenson’s two marriages also took place here. St Michael and All Angels Church has been the site of more violent event: occupation by the Scots soldiers and the murder of an Earl. 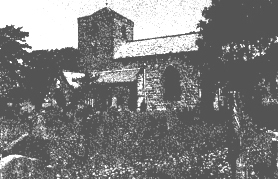 In 1070 Copsi, Earl of Northumberland, was forced to take refuge in the church when attacked by Osulf, a Saxon aristocrat. The church was set on fire and Copsi slain as he tried to escape. In August 1640 a Scots army of some 20,000 soldiers crossed the Tweed and advanced south eventually setting camp on Heddon Law. The ensuring battle took place in the area of Stella Haughs, the English suffering considerable loss of life. At one point the Scots fired canons from the church tower. As you leave the church and pass the library, notice the small rose garden, behind the bus shelter, planted by the council in 1956. This is called Rose Park and was originally on land belonging to the tenth Duke of Northumberland, Hugh Algernon Percy. He rented it to Newburn Urban District Council for one rose per year- hence the rose garden! Walk past the war memorial with the Duke’s cottages on your right. There are further links with the Duke as you pass the other war memorial outside Newburn Community Centre. Hugh Algernon Percy had this memorial built in commemoration of his brother, Henry George Alan who was killed in action in Peco in 1940. Continue along Percy Terrace, cross over to the housing office, which was the former Newburn UDC Office, and walk down Davison, Boyd or Westmacott Streets- they are all named after foreman who worked for John Spencer, the houses being occupied by his employees. At the bottom of the hill turn right and you are soon back at the Visitor Centre. As you leave the Visitor Centre, stop at the white sculpture at the edge of the play area. The sculpture depicts the two aspects of the Newburn region. Looking downstream there are the obvious signs of man’s industrial impact on the region: looking upstream there is a semi-rural scene. Walk upstream and stop at the riverside just after the picnic site. Look for the stone remains which is evidence of a landing point for salmon fishing boats. Further on there is another landing-point remnant, this time built from brick. Continue upstream until you come to a hillock and a stand of trees. Last centuary the river was much broader and shallower here forming an island. There was a ferry operating between the north and south banks of the river: the white house on the south bank is still known as Ferry House. Follow the path nearest the river. Opposite Ferry House you can see the remains of the wooden jetty used by the ferry. The ferryman was Archie Scott whose house on the island was washed away during a severe flood. Because of the frequent flooding of the Tyne, and also to make it more navigable, it was eventually dredged by Joseph Cowen in 1873. Before it was dredged the water level was so low at some places during low tide that a railway track was able to be laid across the river. It was used to transport iron slag from Spencers Iron Works from the north bank to the south. 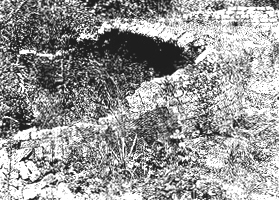 The slag was used to reinforce the river banks. 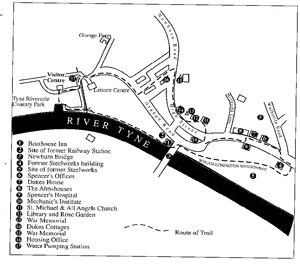 The Tyne has changed much in use and shape down the centuries. 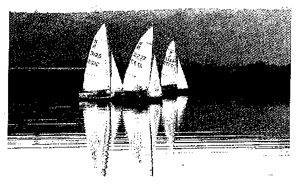 Its uses have included commercial fishing, coal transportation and water sports; early this century there were national rowing events with prestigious prizes to be won. As you walk along the north bank of the Tyne the frequent passage of diesel trains on the south side is a reminder that you are in the birthplace of the railways. The first stage of the Newcastle-Carlisle line was opened in 1835 with trains running to and from Hexham on the south bank. It was not until 1839 that the construction of the Scotswood bridge made possible the extension of the line on the north bank into Newcastle Station. The High Level Bridge, designed by George Stephenson’s son, Robert, was completed a decade later and the King Edward VII Bridge, at the west end of the station, opened in 1906. These bridges of course, took the line you now see on the south bank into Newcastle. 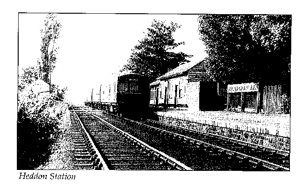 Wylam station is one of the oldest operating stations in Britain, if not in the world! About a mile on, you will arrive at the ‘Tide Stone’ erected, to the right of the path, in 1783. This marks the point at which the river is still affected by the tides. There is a curious story attached to this stone. Last century the Lord Mayor of the region would periodically patrol the borough. Tradition had it that he would kiss the prettiest girl at the Tide Stone and she would receive a gold coin. However this ritual was stopped when it was realised that the mayor was choosing his relatives to receive the dubious honour! Walk for another mile until you come to a clearing with picnic tables, after the golf course. 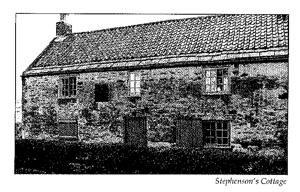 Turn right onto the waggon way and you will see Stephenson’s Cottage. George Stephenson is often credited with the invention of the locomotive but in fact his first engine the Blucher was designed using features from the engines built by William Hedley and John Blenkinsop. (A Cornishman, Richard Trevithick, was the actual inventor and demonstrated a locomotive in 1804). However, among George Stephenson’s improvements were direct drive from piston to wheels, rod coupling of wheels and general strengthening of waggon way construction. The experience gained working for the coal industry made possible his construction of the Stockton and Darlington Railway in 1825. George Stephenson had to convince many people of the practicalities of his ideas and although he had to overcome many obstacles, his belief in himself was rarely shaken. He also invented a miner’s safety lamp, the Geordie lamp, at the same time as Humphrey Davy invented his. At Stephenson’s cottage walk east along the waggonway until you reach Heddon Haughs farm, which was the site of Heddon Railway Station. In 1876 the old waggon way route was replaced by a main line railway which linked Scotswood, Newburn and Wylam with the Newcastle-Carlisle line on the south of the river via a bridge east of Wylam road bridge which can still be seen. The line was not a success and closed in 1968. Walk through the farm yard and look across the field on your left. The pit heap you see is one of the most visible remains of Heddon-Margaret pit opened in 1902. This is also the site of Heddon brickworks and remains of works-buildings can been seen among the trees. 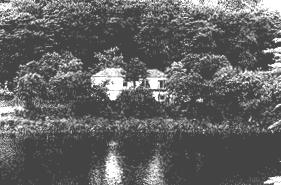 The large building on the hillside is Heddon Hall, formerly the residence of the pit owner, Bates. The white house straight ahead is Flocktons and was the pit deputy of Isabella Colliery’s residence. Head towards Flocktons but just before you get to it, go through a wooden gate on your right. This takes you along a narrow hillside track. As you cross this field stop in the middle and admire the view. Ryton church spire and the villages of Ryton and Crawcrook dominate the southern horizon. In the opposite direction, about a mile away, is the course of the Roman Wall. The two circular clumps of trees below and above you are something of a mystery! Were they planted around pit workings perhaps? Keep to the path and go through another wooden gate. The field on your left is known as West Bank, and the path you are following as Butchers Bank. Follow the path until you come to a fork – take the right hand fork to the pond. Turn left and walk along the edge of the pond. The origins of the pond are not clear: it is marked on old maps as a reservoir and records suggest that the water was used to power a steam engine at Isabella pit. 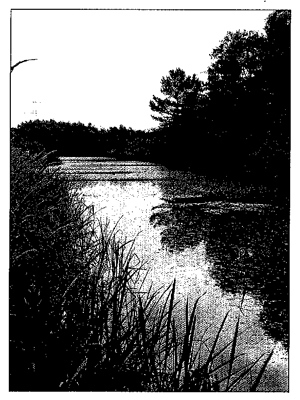 The pond owes its current shape and size to impoundment by shale, most recently during reclamation work done in the early eighties. When you leave the pond, turn left up the surfaced road and then almost immediately right. The area of trees to the left is known as Engine Plantation’ – so called as it was where machinery was stored and maintained for the Isabells Colliery. Behind the trees the pit cottages known as Office Row once stood; nothing now remains except the ruins of brick-yard walls covered in moss, and occasional garden plant amongst the trees. Route A leaves the River Tyne now and skirts round the west side of Moore Court. Continue along the path due north until you come to the waggon way. The houses to your right, Blayney Row, were built for the employees of Heddon brickworks by Bates of Heddon Hall and sold to the Throckley Coal company in 1895. Walk round the west end of the houses into the back lane, and go through a wooden stile on your left. Head north keeping to the right side of the field. You will pass the pond on your left as you cross a causeway. Cross the stream and turn right past the bottom of ‘Engine Plantation’ where machinery for the pits was kept. The site of Isabella pit is on your right. There is little sign of any of it now but in its heyday it produced 120,000 tons of coal a year. The mine was sunk in 1867 and at the turn of the century employed 944 men. It was mined until 1954. A few yards from the fence you will notice a circular patch in the grass; this was the entrance to a pit shaft. Go through the metal gate, turn right onto the Pit Road and cross the Reigh Burn. Water from the old mine workings flows into the burn near this point. The coloration is the result of an underground chemical reaction; although unsightly, the discoloration is restricted to this area. Follow the path south until you come to a small area of trees on your right, past a raised slag heap planted with scrub. These ovens are known as ‘beehive ovens’ and were built in the mid 18th century. Straw and loam were used to build up high temperatures inside and there was an opening at the top of each oven to let out fumes and smoke. 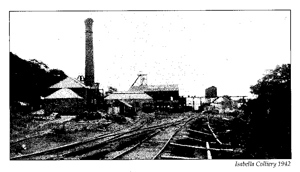 The ovens processed the coal from the Isabella pit producing coke for Spencer’s Steelworks and the Solway Hematite Iron Company. After your visit to the coke ovens continue on the path until you come to a surfaced road. Turn left and walk along the adjacent path until you arrive at the pumping station built in 1854 to supply drinking water to the population of Newcastle. Water from the Tyne was filtered through long gravel-filled channels but due to river pollution and technical problems, pumping ceased in 1885. 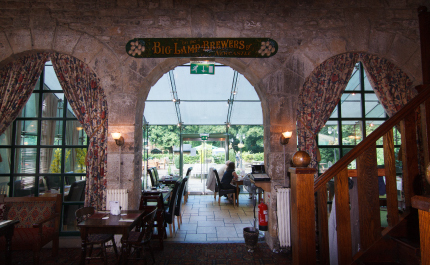 This is now the Big Lamp Brewery and the Keelman Pub. We have now come full circle and with the opening of the Visitor Centre in 1985 are back in the present.